Sara Balabanlilar has a degree in English from the University of Houston. She also runs Barbee Manshun, a pop-up art exhibition and workshop space, with two other UH graduates. In her spare time she has taken up crocheting moss. Although Houston proves itself in the literary arena with multiple organizations hosting readings, workshops, and arts journals, our sprawling oil city isn’t the first place people think of when they imagine an extensive scene for actually publishing those works. However, this city is proving itself in that sphere as well. 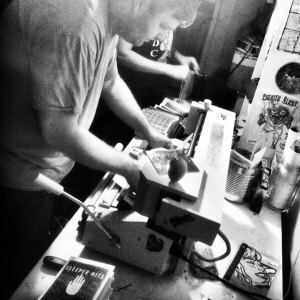 Houston is experimenting, fruitfully, with tiny presses. Some of these small publishers are working to blur the lines between craft and literary production, while others are trying to pull the DIY culture of zines into a more traditionally poetry and prose-based atmosphere. I sat down with Traci Lavois Thebaud and Kalen Rowe to discuss their DIY-based literary projects, Anklebiters Publishing and Whatever, Mom Publications. Sara: Talk about your projects (publishing and otherwise!). What role do you think you have in Houston? For more than fifteen years, Inprint has been proud to serve as host to First Friday. First Friday is the oldest poetry reading series in Houston, held on the first Friday of every month since 1975. The series is coordinated by Robert Clark and features a wide range of local and regional poets. Each evening begins at 8:30 pm with a reading by the featured poet, followed by an open mike. Clark and many involved in First Friday also help organize the annual Houston Poetry Fest, which takes place every October at the University of Houston Downtown. On June 5, First Friday will feature Kenan Ince, a Houston writer to be reckoned with. A Dallas native, Kenan is currently a PhD student in Math at Rice University. 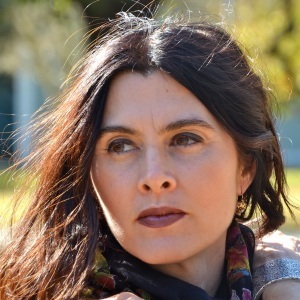 Well-known in local writing circles, Kenan has given many readings around the city, was a juror at Houston Poetry Fest, and has been published in Word Riot, The Hartskill Review, and HeART Online. What can we learn from Kimberly Meyer’s The Book of Wanderings? A big congratulations to Kimberly Meyer, whose memoir The Book of Wanderings came out this March. Kim holds a PhD from the University of Houston Creative Writing Program, where she received an Inprint Brown Foundation Fellowship and an Inprint Michener Fellowship. Her work has recently appeared in The Best American Travel Writing, Ploughshares, The Kenyon Review, Ecotone, The Oxford American, The Georgia Review, Agni, The Southern Review, and Third Coast. She teaches in the Great Books program at the University of Houston Honors College. 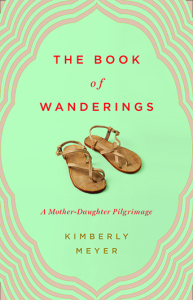 Here, Sara Balabanlilar, Kim’s student (and Inprint’s newest blogger) talks about The Book of Wanderings and what we can learn from it. Houston is a city filled with the angst of constant coming and going. Old buildings fall into disrepair and are easily replaced with three-story condos overlooking huge unused lots or old factories. Paved roads shift and crack in our sandy soil, which is persistent enough to keep any street too smooth for too long. The construction is endless here. All of these things lend to an air of constant change, of dissatisfaction with the space around us and the constant impetus to evolution and growth.